An auction has to be fast-paced. Auctioneers bellow item descriptions and prices. Phone bank operators answer call after call from eager bidders. Bid sorters race to keep bids in order and up-to-date. That’s just what the audience can see – so much more is happening behind the scenes. In some cases, all this needs to happen within an allotted television time slot. It’s no surprise that the event calls for so many extra hands. 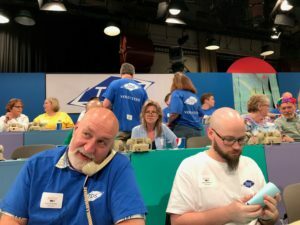 This year, of the more than 800 volunteers needed to work the Wisconsin Public Television (WPT) annual auction, TDS sent the largest group — 42 registered volunteers — coordinated by TDS employee Brian R. He has been working the auction since 2009, and this was the second year he has recruited TDS employees to volunteer at the auction. This year, he worked as a phone bank manager and clocked about 32 volunteer hours across the five day event. It’s the 19th year TDS employees have volunteered for the auction. Many of them take on leadership roles or go the extra mile, such as staying past their scheduled shifts to help with a second shift. 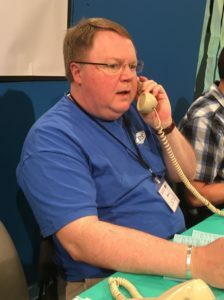 Brain J. works the phone bank at the 2017 WPT auction. One of the TDS volunteers, Brian J., was a first-time auctioneer. It’s also his 10th year as a WPT auction volunteer. His first year, Brian J. decided to volunteer as a phone bank operator and would go on to work in numerous positions throughout the years. He had to audition for the role as an auctioneer this year, and despite being nervous at first, he hopes to hold the same role next year. With timing and accuracy being so important in every auction volunteer position, experience is extremely helpful. Volunteers start in entry-level positions, and other volunteers recommend them for higher positions. This was the 42nd year of the WPT auction. Its proceeds support WPT programming, outreach initiatives, and events. Engineering work has kicked off in Lewis County, Wash.